Description	 MS in Ge'ez on vellum, Ethiopia, 1754 (text 1), 1732, 155 ff. (complete), 38x32 cm, 2 columns, (27x26 cm), 20 lines in Ethiopic Gwelh by 2 scribes, opening lines and section headings in red, 44 quarter- to half-page and 3 full-page paintings. Binding	 Ethiopia, 18th c., tooled leather binding over wooden boards with brocade panels on the inside, chain stitches on 4 sewing stations. Provenance	 1. Wäldä Yohannes & Fesseha Giyorgis (18th c.); 2. Fesseha S'eyon; 3. Wäldä Kiros and his wife Aqlésya; 4. Mälke'a Maryam & Amätä Egziabehér; 5. Sam Fogg Rare Books Ltd, London. 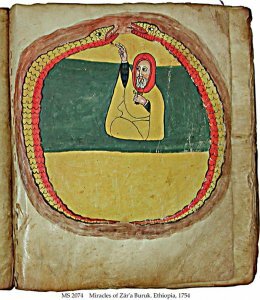 Commentary	 Zär'a Buruk was a late 17th c. Ethiopian monk who founded a religious party, an offshoot of the followers of Ewost'atéwos, which became, along with the latter and the Täklä Haymanot party, the third of the great religious factions of early 18th c. Ethiopia. 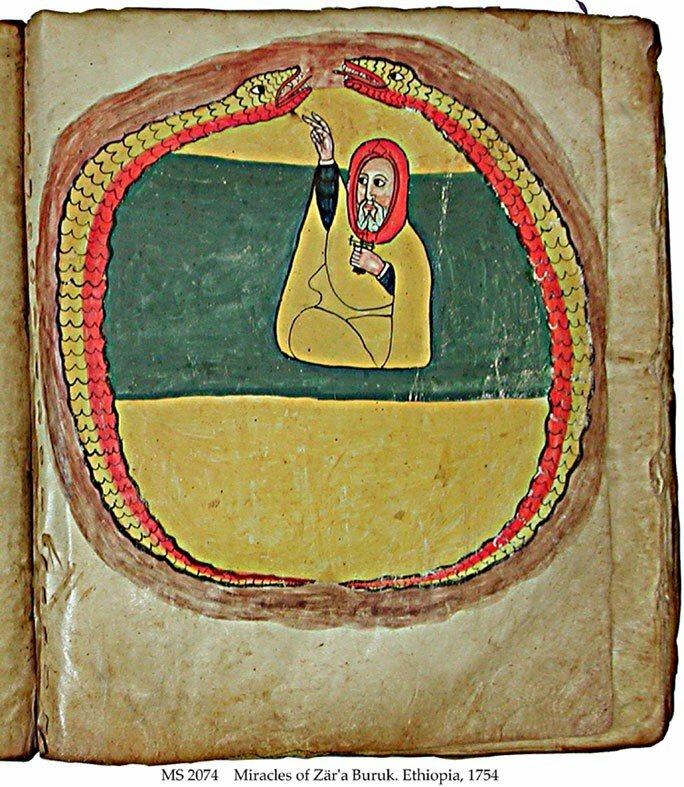 There are not many collections of the Miracles of Zär'a Buruk known outside Ethiopia. Colophon at the end of text 1 stating that the text was completed: 24th year of Iyasu on Thursday, the ninth day of Nähasé (14 August 1754). Text 2 has an opening formula stating that the writing started: the second year and second month of the reign of our king Iyasu, called Berhan Sägäd on the twelfth day of the month of Tahsas on the feast of St. Michael (19 December 1732).